Bob and I had scouted some possible sites on Monday and Tuesday in the week before the event. We finally settled on Cobb Meadow. The Cobb family had, for years occupied this land and had extracted gravel and rock from nearby Sexton Mountain, delivering the material to local construction sites. They lived on the hill near the meadow where they kept several horses. When Mr. Cobb died, he willed this meadow to the local park district, THPRD. I confirmed through an email to THPRD that the meadow is presently available for use, even though there are no signs. The major attraction for FD was a long row of Giant Sequoia on the west edge of the meadow. Most are 100 ft high, having been planted as ornamental trees in the 1920s and 1930s. The Giant Sequoia is native to California where it grows to monumental proportions, and is a popular ornament in the wetter coastal parts of the Pacific Northwest. Saturday arrived; Bob and I headed out, excited for the fun of Field Day. We hiked across the meadow to the treed area we had chosen only to discover that one of the Sequoia was gone! Well, it was not really gone, but had been reduced to a pile of debris on the ground. 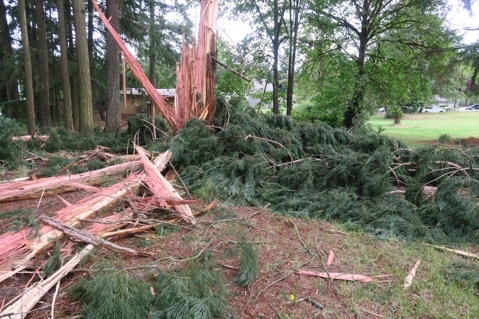 We had a lightning storm on Wednesday (June 20th) that caused many local problems. This 100 ft Sequoia was one casualty. The photo below shows the remains. There were numerous other trees that allowed us to get antennas in the air. Bob put up an end fed half wave for 20 meters and I erected a 40 meter inverted-Vee. Both of us wish that our antennas were higher, but that is always the case. Both of us operated our respective bands and had a lot of fun. Photos are shown below. 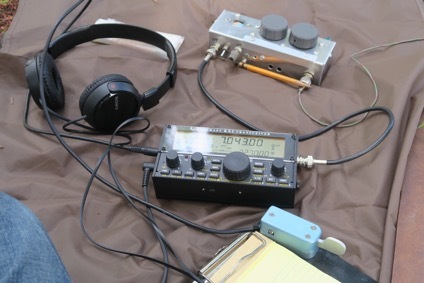 Both of us used Elecraft KX2 transceivers. These are great little rigs, although I'll confess to missing my own rigs. I used the KX2 interior battery pack for an entire afternoon at 5 watts. Modern battery technology is great. Bob and I left after a few hours of operation, although both of us wished for more action. 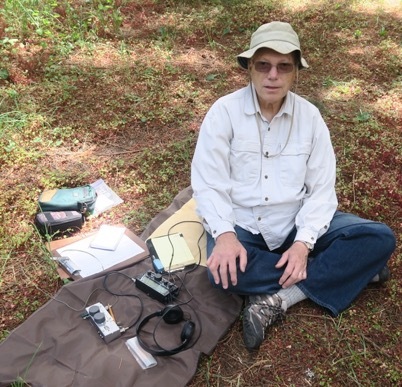 Bob got on the air from home for a few additional contacts on Saturday evening. I did the same on Sunday morning, catching some Es propagation on 10 M CW. 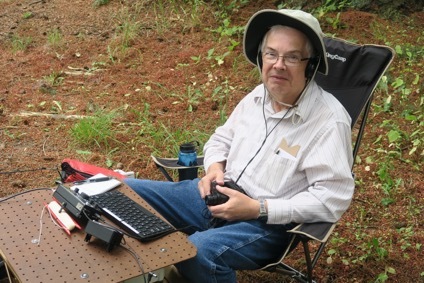 Here's a shot of Bob operating 20 CW. The chair and portable table are new additions to Bob's setup. Here's 'zoi at the 40 meter position. This is a closer look at the 40 meter gear.